Loaded Potato Salad has all the good stuff: smoked sausage, bacon, cheese, ranch seasoning and chives. Everything you love about baked potatoes in a salad! I’m also sharing my easy secret to perfectly cooked potatoes that don’t turn to mush when you make them into potato salad! Potato salad is one of those popular dishes that shows up at food events all year long. There are many variations on three main kinds. German potato salad usually has an oil based dressing and is served warm. Traditional American potato salad has a mayonnaise dressing, bacon, eggs and pickles. 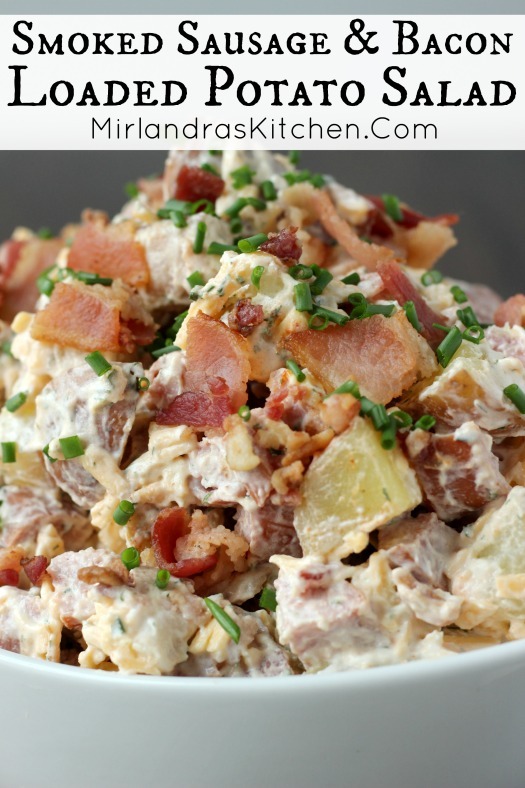 Finally, Loaded Potato Salad typically uses a sour cream / mayo mixture, bacon, cheese and sometimes ranch seasonings. I of course had to add some good sausage like my Daddy used to! The secret to any great potato salad is excellent potatoes that are perfectly cooked and don’t turn to mush when you add the good stuff. Seriously, is there any worse potato salad crime than glop that has sort of turned into mashed potato salad? 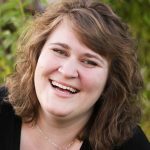 I tested multiple methods and finally settled on a method shared by America’s Test Kitchen for cooking the potatoes gently and quickly. All the details are in the recipe. I think you will love this easy trick for perfect taters! Let me know how you like it. Happy cooking! Tools In This Post: I keep my bacon prep easy but using these kitchen sheers to cut it up. They cut raw bacon like it is butter. The AnySharp company sent me a sample to check out recently and I was blown away – best kitchen scissors I have ever used! As a bonus there are multiple things you can do with them! Love creamy salads? 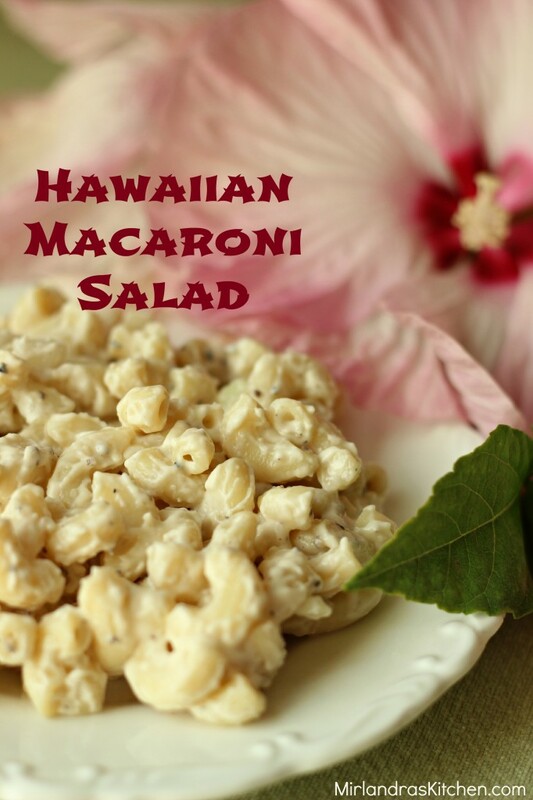 This Hawaiian Macaroni Salad is one of my personal favorites and one of my all time most popular posts. 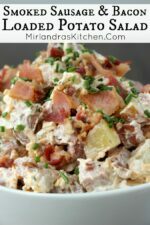 Loaded Potato Salad has all the good stuff: smoked sausage, bacon, cheese, ranch seasoning and chives. Everything you love about baked potatoes in a salad! I'm also sharing my easy secret to perfectly cooked potatoes that don't turn to mush when you make them into potato salad! 10 oz fully cooked beef smoked sausage I use the skinless one from Eckrich-it is excellent! Prepare potatoes to your liking. Scrub and peel half or none or all of them. Chop into bite sized pieces, about the same size. Place the chunked potatoes in a medium-large pot and cover with 1” of cool water. Bring the potatoes to a boil over high heat, then reduce to medium-heat and simmer until fork tender. About 10-12 minutes. While potatoes are cooking combine black pepper, dill, paprika, powdered garlic and white pepper in a small bowl. Use a fork to stir together. When potatoes are cooked, drain thoroughly in a colander. Spread out on a baking sheet and sprinkle with the spice mix. Toss gently or flip with spatula to coat. 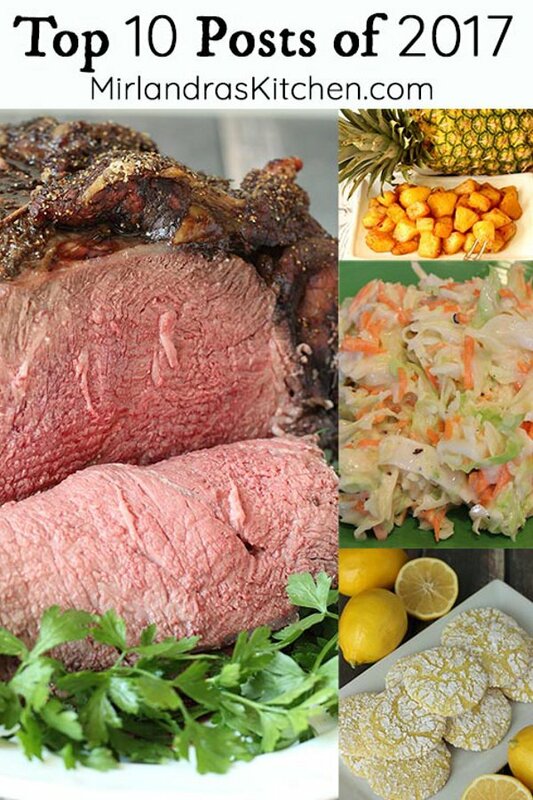 Cool in the refrigerator 30 minutes. Cook in a cast iron skillet or other frying pan over medium-high heat, stirring frequently for two minutes. Turn down to medium heat and continue to cook until bacon is just cooked and almost starting to crisp about 2-3 more minutes. Save the bacon drippings and use a slotted spoon to spread the bacon out on paper towels to drain. Cut the sausage into quarters lengthwise and then dice it – set aside. In a medium bowl combine chives, sour cream, mayonnaise, milk and bacon drippings. Whisk together until the mixture is smooth. Then add the drained bacon, sausage, and cheese. Add the potatoes and gently toss until everything is well coated. Chill for 30 minutes to a few hours so everything can meld nicely and serve cold. How many days ahead can u make this recipe? I have a lot of people coming for dinner and would like to make ahead. All salads like this will get stronger in flavor the longer they sit. Since there is such a thing as too strong I would suggest making it on Saturday to serve on Sunday. If that is not an option I think you could get away with Friday too but I wouldn’t do much before that. Enjoy and happy Easter!